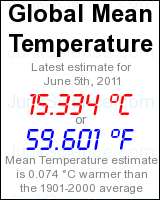 It looks as though Al Gore will need to work on controlling public opinion rather than greenhouse gases. Global warming alarmism and support for greenhouse gas regulation is slipping in eco-cidal California, according to a new survey by the Public Policy Institute of California. Most residents (66%) support the 2006 California law (AB 32) that requires greenhouse gas emissions to be reduced to 1990 levels by 2020. Support has declined 7 points from July 2008 (73%) and 12 points from 2007 (78%). The decline is sharpest among Republicans (57% 2008, 43% today). While most see global warming as a threat (47% very serious, 28% somewhat serious) to the economy and quality of life in the state, the percentage of residents who categorize the threat as very serious has declined over the past two years (54% 2007, 52% 2008, 47% today.) Residents are divided over whether the state government should take action to reduce emissions right away (48%) or wait until the economy and state budget situation improve (46%). In July 2008, when the plan to implement AB 32 was being discussed, a majority (57%) said the government should adopt it right away rather than wait (36%). The Climate Protection Action Fund, a subsidiary of Al Gore’s Repower America, paid $60,000 to the Glover Park Group during the second quarter of 2009 for lobbying on Waxman-Markey. We earlier reported that Al Gore’s venture capital firm, Kleiner Perkins Caulfield & Byers, paid $100,000 in lobbying fees so far in 2009. Al Gore failed to disclose any of this when he testified in April before Congress in favor of Waxman-Markey. Click here for the CPAF lobbying report. ClimateWire reports that a Gore spokesman failed to respond to several requests for comment. No matter. 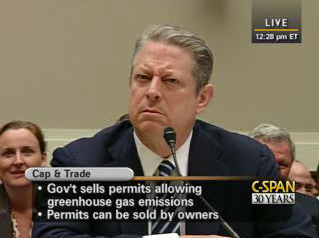 Had the Gore camp responded, it likely would have been with a face similar to that below, when Al Gore denied at the April House hearing that he had any business relationship with Goldman Sachs. Beware of greens bearing free carbon allowances. Climate bill supporters are trying to attract Senate votes for Waxman-Markey by touting the free carbon allowances that would be allocated to individual states. This analysis by the World Resources Institute, estimates the range of free carbon allowances for energy consumer assistance programs on a per capita basis at $40/person (California) to $160/person (Wyoming) for the year 2016. The average assistance level is $90/person. While such “free money” sounds great, it does have a hidden cost — higher energy prices that far exceed the value of the allowances. For example, Georgia residents would receive about $80/person/year in free allowances to offset higher energy costs. But the head of the Georgia Public Service Commission recently stated that a climate bill would raise energy costs to the average Georgia Power customers by an estimated $66/month by 2020. So while a family of four might get free allowances worth $320/year, their cost of electricity would increase by $792/year, a net loss of $472/year. Would you pay that much money annually for a government program that accomplishes nothing?